Do you ever feel like cooking in your kitchen is one big stress-fest? Well, cooking is not meant to be a tense or chaotic activity; in fact, a lot of foodies turn to cooking as a way to de-stress. Look around; maybe all the stressing out in your kitchen has something to do with it being disorganised. 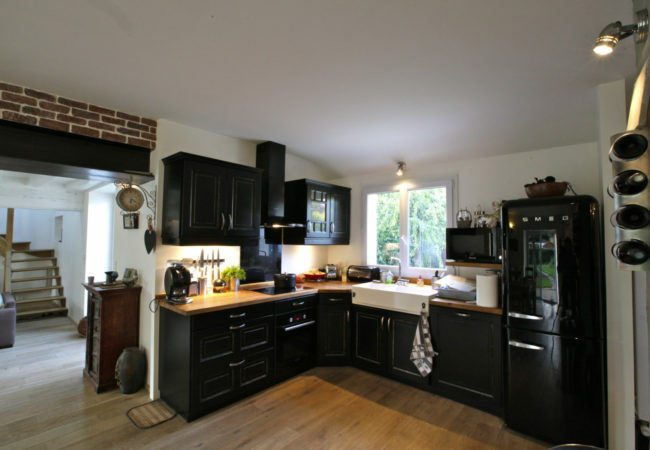 Due to excessive daily activity in the kitchen (generally from multiple people), it’s common for this particular area of your home to get a little disorderly. If you really want get your kitchen organised so that it remains a stress-free environment to work in, it’s best you take some time out to put some order back into it. With these kitchen organisation tips, you’ll say goodbye to kitchen chaos once and for all! What’s the point in organising items that are merely cluttering your kitchen? We’re talking about expired products, rarely used items and unwanted or unused cutlery, dishes and containers. For example, you may have a brand new set of knives or glasses that are sitting in your kitchen cabinets that are not intended for use for years to come. These are things you need to store elsewhere for future use so that they don’t get in the way and aren’t accidentally damaged or broken (because they got in the way!). In simple terms, to declutter your kitchen means to remove or store away anything that that is not of use to your kitchen needs. An organised kitchen generally has a lot of racks! These organising aids don’t take up much space and can be installed in several places including walls, on the side of kitchen cabinets or on inner cabinet doors. They keep spice jars and other bottled ingredients well organised and off your counters and shelves which tend to take up space and cause clutter. What’s more, they come in various sizes to accommodate larger jars and containers so there are always suitable options for your kitchen. The kitchen is home to plenty of cutlery (generally more than we even require). We’ve already advised you to store away items that are to be used in the future; however, there are many cutlery pieces that we use on a regular basis, if not daily. The best way to organise your spoons, forks, knives, ladles, spatulas and serving spoons, is by segregating them with the help of cutlery trays. They fit snuggly into drawers and shelves making it much easier to find what you’re looking for, as well as put away. Apart from cutlery, you can use regular trays to keep cabinet items (like food colouring bottles and essences) in an orderly manner. While stacking pots and pans one inside the other on shelves is the most organised and space-efficient way to store them, it’s not always possible to do that when the shapes and sizes don’t permit. For the odd ones out, the most organised way to store them is either in roll-out drawers, or hung on a row of hooks against the wall. Not only does this keep them in a neat manner, but also makes it quick and convenient to access. Picking out a pot from a shelf would mean pulling out other pots first to get to it, so you should also consider keeping the more frequently used ones on hooks or in roll-out drawers. 5. Clean, Clear, Clutter-Free Counters! What started off as a clutter-free countertop and a joy to work on slowly turned into an overcrowded island with barely enough working space. Sound familiar? That’s because it happens in most kitchens. If you find clutter on your counters in the form of holders for ladles and spoons, miscellaneous items like cutting boards, graters and peelers, or additional racks, get them off your counter! As mentioned earlier, racks can be installed in various places; miscellaneous items can be put in drawers or cabinets that now have more space thanks to the storing away of unused kitchen accessories and the disposal of unwanted items; and ladles and spoons can be put in their designated compartments in the cutlery trays. At Simply Maid, we’re all about house cleaning, organising and guiding! From easy, do-it-yourself home guides and tips, to professional services in thorough household cleaning; we are here to help make your life easier. We’re just a 60-second booking away to a speedy cleaning service at your doorstep, ready for action. Take a look at our affordable rates and super services if you need any more reason to book a cleaning with us! Read more about us here. Laying it Down for Kids Lazing Around – 5 Simplified Cleaning Chores! Clutter-Free Homes – Take the Clutter Out, Bring the Coziness In! Next Post: Your Average Bathroom Cleaning Tips Taken to the Next Level!